I give them what they want, until they come to want what I have to give. Sai Baba of Shirdi Sai Baba, is an Indian religious figure who lived from the mid-19th Century to October 15, 1918. He was considered a Guru and holy man to both Hindus and Muslims. Like Bhagavan Nityananda Sai’s childhood is obscure. Some believe that he was raised in the village of Pathri, by a fakir and his wife. When he was around sixteen years old he arrived in the village of Shirdi, in Maharashtra. He lived a very ascetic life, spending many hours in prayer and meditation. Some called him a saint; others were less impressed by this ascetic. He settled in a run down temple, and later a dilapidated mosque. Without any attempt to attract followers, both Muslim and Hindus were drawn to his presence. As well as teaching spirituality and tolerance of religions, he was also known for his ability to create miracles, such as materialising objects out of thin air. As his life progressed, increasingly big crowds were attracted to wherever he went. 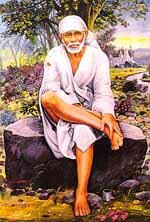 Sai lived in Shirdi all his life and was buried in the Buty Wada, also known as Samadhi Mandir. Some months ago, Swamiji found out that his friend Premakantha Kurukal, a Brahmin priest, was tending a Sai Baba temple in Mordialloc, a small town a half hour drive from the ashram. One evening Swamiji decided to surprise him with a visit. Tricky to find, hidden by the side of the railway line we wandered through a small lane, much like the paths in Varanasi. At the end, a row of shoes led us to the door of the temple. I gasped in wonder as we walked in. There was Sai Baba resplendent in Shakti and love. I was in awe as to how beautiful and alive he is. He is just as beautiful as the murti in Shirdi. His radiance is startling. Premakantha was travelling, but a young man gave us fruit and flowers to offer Sai and we sat to meditate. On either side of him are two words: the one on the left as you face him, is shraddha, meaning have faith and believe in him. The other on the right is saburi, meaning have patience. Two great statements for all those who are praying to him for blessings and boons. A rarity in a temple, everyone participates in the Arati–you can wave the light and fan him in the traditional way. It is delightful to participate in the Arati, chant and soak up the blissful energy. It is a beautiful ceremony and love flows from Sai and the devotees as chanting fills the space. It is intimate, powerful and full of love. A few weeks later Swamiji took a group of us to the temple again. Premakantha was ecstatic to see him and us. He greeted us all with love and joy and immediately had Swamiji waving the lights during Arati. Sai Baba seems to be everywhere these days. In India his photograph and temples are all over the country and now he is very present in the West. There are at least three temples that I know of in Melbourne. He is renowned for granting the wishes of his devotees, whether it is for a marriage, a job, health issues, relationship, a child, and whatever the heart desires. On my most recent visit to the Mordialloc temple, I was astonished at the amount of shakti and love permeating from him. As I walked toward him, I felt a familiar welcome that I have always attributed to Baba Muktananda. But there now Sai was smiling and twinkling. I felt a deep acceptance; Sai’s blessings surrounded me and I was infused with his grace. Like Bhagavan Nityananda his Consciousness lives wherever he is praised and worshipped. His devotees say that he himself said that after his samadhi, he would bless and protect everyone who takes refuge in him. Truly speaking he is one of the greatest siddhas that ever lived. The hundredth anniversary of his samadhi is this year and it is likely there will be pujas, aratis and chanting programs in all of his temples. The wretched and miserable will rise to joy and happiness as soon as they climb the steps of the mosque. My mortal remains will speak from my tomb. I am ever living to help and guide all who come to me, who surrender to me and who seek refuge in me. If you look to me, I look to you. There shall be no want in the house of my devotee. In 1977 Das and I joined a large group of devotees from America for our first trip to India. We were to spend three months in Baba Muktananda’s ashram, Gurudev Siddha Peeth. After a long drive through the rural landscape of small dusty villages and parched country, the bus from the airport pulled up outside the ashram. I had seen pictures and videos of the ashram, but I was unprepared for its beauty—a small palace, it gleamed shakti from every corner. We walked through the gates to a small marble courtyard and it took my breath away. ‘Leave your ego with your shoes’ demanded the sign above the shoe rack. Amused I took that as my first Ganeshpuri command. Immediately, I felt an acceptance, a familiar welcome that was Baba. He was sitting on his perch at the front of the courtyard waiting to greet us. The atmosphere was exotic and inviting. There were date palm, mango and banana trees planted throughout. We all sat down. After a short while he told us to take rest. We were shown to our rooms and I collapsed on the bed for almost twenty-four hours. The next morning I awoke to clanging bells and a loud chant blaring over the loudspeakers. Nityananda Mahan rang out as I made my way to the program. I was cold from the early morning damp and not used to walking on the marble floors, which sent shivers up my spine. The Ann Arbor ashram was a small world compared to this one. Life was big here. Hundreds of Westerners and Indians worked together, meditated together, ate together, and lived together. More devotees came on the weekend often bringing delicious sweets and curries. I became aware that I had been carrying a burden of some sort, and that I now felt much lighter. A subtle weight had been lifted. It was easy to settle into ashram life. There was little discomfort or friction. We were asked to report for ashram seva, service to the Guru. I was given a mop and a bucket and told to scrub the floor of the outer courtyard where everyone entered. The ‘ego’ sign was visible as I washed and scrubbed. Every morning for the next three days I went to the seva desk for my bucket and brush. I got down on my hands and knees and scrubbed each marble tile with great thoroughness and inner joy. My acceptance was so deep that when they told me to scrub the cracks with a toothbrush, I was still ecstatic, such was the exalted condition of my spirit. The outer courtyard comprised the entrance to the large courtyard where Baba sat, and to the temple that held the murti of Bhagavan Nityananda. Bhagavan sat at the front of what used to be the meditation hall; he was life-size, dark brown, and beautiful. Baba went to see him each morning as the priests bathed him. I sometimes got up early to watch him garland Bhagavan and participate silently in his devotion. As Baba greeted him, a tangible sweet feeling permeated the atmosphere. It was intimate, affectionate and moving. Bhagavan seemed to light up as Baba silently moved around him while reverently chanting mantras. Baba walking through the inner courtyard. After breakfast I raced back to the hall, where a small group chanted the Rudram, an ancient Vedic prayer to Shiva. The Sanskrit words were long and difficult to pronounce but I was soon able to follow along. The Shakti responded to this prayer with a mysterious power and vibrated throughout my whole being. The Rudram and the Shiva Mahimnah Stotram that we chanted in the evening both have a mysterious effect and uplift my soul every time I chant them. In the mornings after seva I sat in the inner courtyard where Baba conducted ashram business. I watched him work as various managers and secretaries came to him with questions and reports. He was more approachable here than when he was traveling in the West. He sat out there sometimes for a few hours. Many brave ashramites asked him questions about spiritual and worldly life. Although I could not hear his answers, most walked away beaming. I wanted to approach him, but I didn’t have a question. I was in deep communion with him on the subtle plane where the Shakti was dancing and no words were necessary. Baba was always at ease, in control and yet not in control, active and yet not active. He participated in life and yet was detached. There was an enigma in his presence. I treasured this time. He was beautiful to watch, his self-mastery apparent. There were few people and I was able to sit close and bask in the loving energy that flowed from him. My mind was quiet and I meditated even though I was watching everything. There was stillness at the centre of my being. For the first time I meditated with my eyes open. As my awareness moved around the courtyard, the Self was tangible. I watched, I listened, I saw, I observed and I remained connected to the Self. Sitting there is etched in my memory. Some weeks after we arrived, Baba organized a four-day yatra, a pilgrimage to some of the local holy sites. I looked forward to Alandi, the samadhi shrine of Jnaneshwar, one of India’s greatest saints; to Dehu, the birthplace of another saint, the poet Tukaram (one of Swamiji’s favorites); to Shirdi, the village where the famous Sai Baba had lived and to Poona for a rest. Baba warned us not to give money to the beggars. Wise advice, for at the first stop we were assaulted by a mob of children pleading for money. My heart went out to them but I heeded Baba’s warning. He was generous to a fault when it was appropriate. He built homes, hospitals and schools around Ganeshpuri. He fed and clothed the locals and gave them jobs. He did not, however, want us to give money to street beggars. Once, when I walked the streets of Bombay alone, I made the mistake of ignoring Baba’s advice and gave some money to a child that had no hands. I was immediately assaulted by a crowd of children. They grabbed at my purse. Fortunately, a taxi driver intervened and chased them away with a big stick. Alandi was the first stop. Jnaneshwar was a born siddha, who translated the Bhagavad Gita into Marathi at the age of fifteen, for the local people. When he was twenty-two he told his devotees that he was going to take live samadhi. He asked them to dig a hole in the ground. He told them that he would sit and enter meditation and then they were to cover him with dirt. And so they did. This is a kind of samadhi where the consciousness of the saint stays with the body and continues to give blessings to devotees. Several hundred years after his burial another holy man, Eknath Maharaj, had a dream in which Jnaneshwar told him that he was being choked by the root of a tree. Eknath dug up the grave to find the body warm and alive, although in a trance state. He removed the root that was around his neck and again covered him over. It is believed that he is still alive. I considered this to be an unbelievable story. I cannot think of a worse death than being buried alive. I looked up into the face of the Brahmin priest across from me as he reached out to stop me from falling on top of Jnaneshwar’s head. He was smiling in amused agreement. I unsteadily rose to my feet with his help. I was completely intoxicated. I couldn’t believe it. There was no doubt that his presence was fully there. I consider that one of the most wonderful moments of my spiritual life. Now it is impossible to get that close to Jnaneshwar. I feel fortunate to have had his blessing and darshan. I was astounded by the unabashed voicing of wants and needs in the Indian culture. It used to be difficult for me to articulate what I want and then to ask for it. It somehow never felt quite right, as if my true needs are always being met. Worrying about myself caused an anxiety I avoided. I prefer to pray for others while and hope that if my prayer reaches others, it will touch me also. We were to spend the night there and were settled in large open rooms with straw mattresses on the floor. The accommodation was rudimentary but the atmosphere wonderfully joyful. We went to evening Arati, prayer, which was held in a small hall that contains a life-size marble statue of Sai Baba. There was energy, enthusiasm and excitement as devotees sang out the Arati, and danced in ecstasy. They were uninhibited and unselfconscious in their expression of love. I watched in admiration at the ease with which they showered their praise and adoration. Horrified, I turned and ran out to find another toilet. That night my sleep was restless. I could not free my mind from the image of the dog’s despair and suffering. The next day as we headed for Dehu I felt sick. I got worse as the day wore on and by the time we got there I was so sick I had to be driven back to the ashram. Once back in the ashram I quickly recovered but it was not over. Our first night back Das had a dream in which the dog came to him and attacked him. Das told me that he battled with him in his dream state for what seemed all night and, in the early hours of dawn, was finally able to fight him off. Baba sometimes spoke about fallen yogis who can get trapped in the body of animals. The next day we agreed that the dog was probably a fallen yogi, trapped in the body of the dog. The dog was experiencing intolerable shame and suffering. To this day I remember the pain in his eyes. It was as if there was a person in there. I will never forget the degradation I felt in that soul. I had experienced the best and worst of India. Even though Baba’s physical presence is gone, his shakti resonates everywhere. I once heard him say that when he leaves his body he would remain in the hearts of his devotees. I am grateful that he has taken residence in my heart. I have noticed that the disciples who hold to his feet and teachings are radiant with his blessings; their lives are fuller and richer for having him as their Guru. One who loves his own Self loves the whole world. At this time of year my thoughts turn toward Baba Muktananda as his solar and lunar birthday come around. Born May 16, 1908, he lived a yogi’s life; it was was full, rich, filled with Shakti and mystical. He served humanity until his last breath. I cherish my time with him and every encounter I had. Below is one of them. In July or August of 1979 Baba sent Swamiji to Los Angeles, California to run the ashram there in preparation for his visit in 1981. Until then he had been head of the Ann Arbor ashram with Girija, his wife. It was a thriving spiritual community. Swamiji was a guru to many devotees and the ashram reflected their devotion. This was a sudden and unexpected decision by Baba. I was devastated, as were many others. It was unfathomable that Swamiji would not return to Ann Arbor. After a few weeks and much thinking, I got up the courage to write Baba a letter in the hope that he would give me permission to join him. I told him that I loved Swamiji, that he was my guru, and that I missed him. Unfortunately, I knew Baba was right and that I was too attached to Swamiji. But, the pain of separation was an agony that I did not want to live with. I accepted Baba’s directive but there was an uncomfortable angst in my heart. My seva at the time was coordinating the Siddha Path magazine with Swamiji. It chronicled Baba’s travels around the world and helped devotees at home keep in touch with Baba. I supervised the production and made sure it met deadlines. It was a big seva and becoming bigger, as every day we had more and more subscribers. One morning in meditation I realized that it was impossible to run the magazine with Swamij, if he was in LA and I was in Ann Arbor. I was so excited. His attendant Noni was on the other end of the line, but I could hear Baba shouting in the background, ‘Baba says you should go immediately to Los Angeles.’ Within two days Das, my husband at the time, who also helped with the magazine, and I were on our way. We arrived before Baba had a chance to inform the devotees in LA and he was surprised when he found out we were there. We had been in LA for some months when Baba’s tour arrived in Oakland, Northern California. The hard-working ashramites had transformed an old brothel into a beautiful urban refuge. Back then Oakland was a poor, mainly black suburb. There were homeless people, addicts and alcoholics wandering the streets. Cars were burgled regularly. This did not stop devotees from buying the neighbouring dilapidated houses. The community was buzzing with renovations. One afternoon I was walking away from lunch when Swami Samatananda approached me. He told me Baba wanted to see me. I was excited and scared. At that moment Das appeared. He took us to a darshan room where Baba conducted business across a small courtyard at the back of the ashram. When we walked into the room I noticed Amma, Baba’s secretary, and some other staff who worked on ashram publications were there. We pranamed, (bowed) to Baba and when I looked up at him I went into ecstasy. Bowing was a custom I had become used to during my time in India. While there, I had noticed that not only did the Indian devotees throw themselves at Baba’s feet with great ardour, often almost tripping him as he walked by, but also young adults bowed to their parents and grandparents as a sign of respect. There is a mysterious bliss in showing devotion by bowing. We always put a picture of Baba on the cover of the magazine. Then he held up a copy of an Indian publication that Amma produced. It had a picture of the Ganeshpuri Ashram on the cover. ‘You can put a picture like this on it. No more of me’, he commanded. ‘Okay Baba’, I said. Amma giggled. ‘Did you get a job? ’ Baba asked me. ‘No Baba’, I said. I was proud of my new suit that I thought seemed more ‘professional.’ I often met with people who worked on the magazine and thought my way of dressing was appropriate. I sensed Baba’s disapproval but it wasn’t enough for him to bust me. My bliss increased. ‘I have had a lot of complaints about you’, said Baba. ‘People are writing me about you’, he added, holding up a sheaf of letters. Swamiji had told me that Baba hated hearing complaints about others, unless he wanted to know something. I was reassured by that thought. ‘You should welcome others with love’, said Baba. I was uncertain how to reply. I understood that Baba was trying to teach me something. Even though his manner was gruff, I did not feel anger, only love. Baba was speaking directly to a chronic fear of strangers, my shyness, my inability to talk to people I did not know, and what I thought was a social ineptness. He thought for a moment. And then he gave me a profound teaching. I was overjoyed. ‘Okay Baba’, I said as I basked in his love and attention. ‘Here,’ he said, ‘they are just jealous, but you should welcome everyone’ and he threw the letters at me. Ever since that moment I have used Baba’s welcome formula. Now I am comfortable in social situations when I meet new people. And, when we returned to LA I made an effort to welcome others, including the women who wrote the letters to Baba. At the ashram I was a ‘busy ashramite’, and did not think of myself as part of the ‘welcome committee.’ It did not occur to me that others needed to be put at ease in Baba’s ashram. I always felt so comfortable, so natural in Baba’s ashrams, even though I shied away from people. His welcome formula was a spiritual and personal breakthrough. And, I also learned that a smile is the most welcoming greeting. For the second time Baba encouraged me to ‘love everyone.’ This was becoming a theme in my spiritual growth. Baba’s adage, ‘See God in everyone’ epitomised the way he was. His gift of welcome was the capacity to greet each person he met as if they were the only one in a crowded hall of thousands.